Welcome to Mondays With The Mad Scientist! This is a guest column by four-time Olympian, Quickblade Paddles founder and all round SUP guru, Jim Terrell. 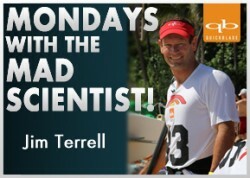 This week on Monday’s With The Mad Scientist! Jim Terrell shares his unique insights into sprint racing plus we get a sneak peek at a his crazy new concept SUP race board. If you’re anything like me, your goal is to paddle faster than everyone else every time you enter a race. The only way to do that is obviously through a lot of training, but how focused is your routine? And are you really getting maximum benefits out of every SUP training session?